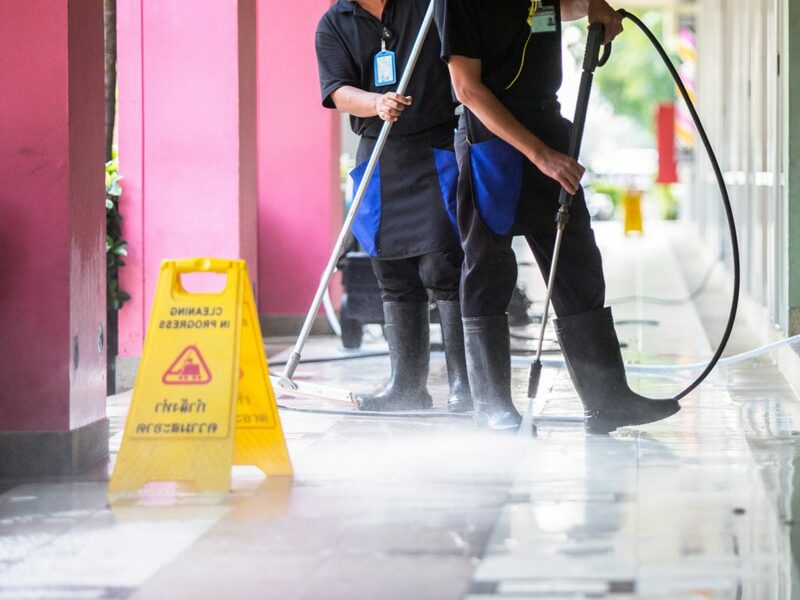 For small business owners and homeowners, there are many benefits of upgrading to one of the better commercial pressure washers. With a variety of applications, more and more people are using pressure washers to improve the exterior appearance of their home or business. Great for maintaining outdoor equipment for industrial uses, a pressure washer can also help you clean patio furniture, fences, wood decks, driveways, and boats. But while many rent pressure washers whenever they need them, there are great benefits to owning your own. Renting can be expensive, and you often run out of time. With so many applications for a commercial pressure washer, you still need to return the device before you’re finished. For business owners and homeowners, the question is which commercial washer to invest in. It can often be overwhelming to scour the brands and products and try and make a decision. Don’t worry, we can help. We’ve compiled a list of the best commercial pressure washers to guide you along the way. Once you know the benefits of using a pressure washer for your home and business, you’ll see investing in one can save money. You’ll avoid the expense of renting. Also, commercial pressure washers have a longer lifespan than other varieties. They are less likely to need updating or to breakdown after extensive use. The best overall value is a commercial washer. With the real estate more active than it has been in 10 years, commercial pressure washers can also boost the value of your property. More real estate transactions mean a competitive market. Using a pressure washer to maintain the exterior of your home or business will help you maintain value. Real estate experts recommend power washing your home to remove dirt and dinge from paint and wood to boost curb appeal. The first question to ask is if you want electric or gas. Conventional wisdom in commercial pressure washers is that gas provides more power than electric models. Advances in technology have made distinct advantages in both types but we still favor gas-powered for the toughest tasks. A gas pressure washer will likely be more durable and oftentimes more powerful than its electric counterparts. Due to transporting gas and machinery, these pressure washers may be heavier as well. But we have identified some lightweight options in gas-powered machines to keep you mobile. Electric pressure washers are sometimes more convenient than gas-powered options. They are often easier to maintain, with less complex machinery. And the newer electric washers have powerful motors and can handle major tasks. Ask yourself about storage space, convenience, and your typical job types prior to investing. Also, if you are planning on bringing your washer to the marina, or transporting between home and business, size and weight are a major consideration. Unless you have a commercial vehicle and ramps, the wheels on your washer won’t help when moving long distances between jobs. Beyond electric or gas options, the best commercial pressure washers offer a variety of capabilities. They have varying degrees of pressure and power for your tasks. 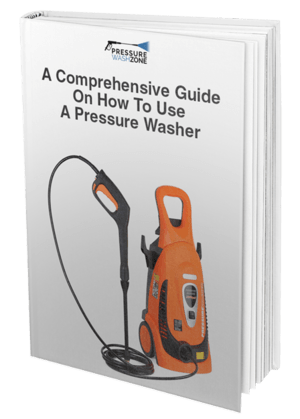 Knowing where you will most likely be using your machine will help determine what you need for pressure volume and hose length. In addition, we think the warranty is especially important when buying a commercial washer. We’ve compiled a list of our best bets based on these criteria. These commercial pressure washers will tackle the toughest job and be an outstanding value. At 4200 PSI the Simpson PowerShot will give you plenty of power. Simpson commercial pressure washers are powered by Honda engines, a symbol of quality and durability. Like many of the other washers on the market, the PowerShot comes with a variety of nozzles. You can choose between 0 degrees, 15 degrees, 25 degrees, 40 degrees and soap options. It’s built to last too. This washer has heavy duty welded steel construction and a steel axle frame with 13-inch premium pneumatic tires. Every part of your Powershot will be protected under warranty. The Simpson PowerShot uses more pressure and more water flow for even greater cleaning performance and faster job completion. If you agree that time is money you’ll want to learn more about the PowerShot. If you need power and more power, the Generac is for you. Perfect for industrial uses and the heaviest job, the 6565 packs a punch. Plus, with 50 feet of steel-reinforced hose, you can reach every spot with the Generac. It’s able to be gentle too. The Generac’s Pressure Control Valve provides complete control of water pressure for all applications. The spray gun is adjustable and the side handle provides precise control with a cushion grip and easy-to-pull trigger. With a variety of nozzles, you can find the optimum tools. You’ll choose between 0 degree, 15 degree, 25 degree, 40 degree, and soap options. The 3-year limited warranty impresses us too. Generac stands behind their products. Plus, the Generac leaves the competition in the dust with pressure options. At 4200 PSI there’s no question you’ll have all the power you need for every job. Clicking here now will tell you more about the benefits of the Generac 6565. The Simpson Water Blaster 4200, also known as the Simpson 60205, can make commercial cleaning tasks fast and easy. 4200 PSI of pressure keeps this member of the Simpson family in an elite class. There’s enough power for every commercial and industrial application. The Water Blaster has the same warranty and nozzle types as the PowerShot. It also has a great Honda motor to keep your pressure blasting at high intensity whenever you need. Tough and easy to use, the Water Blaster balances high performance with an ultra-lightweight aircraft grade aluminum frame. And you can use the Water Blaster for long durations without worrying about engine burnout. This washer features a belt system that allows for a separation of engine and pump. There isn’t a tougher machine for commercial cleaning. Choosing a Simpson Water Blaster will offer you a durable machine with lots of power. Another high-powered option is the Karcher G 3000 OH. For homeowners and business owners who need a powerful pressure washer to tackle cleaning jobs, Karcher can help. Like the Simpson products, the Karcher G 3000 OH features a Honda engine to provide quality and reliable power for every job. You’ll love the low-stress maintenance Karcher provides. Their maintenance-free pump with brass head has your Karcher ready to go when you are. A 25-foot hose and Pro-Style quick connect nozzles let users get to every spot they need to clean. With a 2-year Engine Warranty and a 2 year Pump Warranty, you know Karcher backs their products. You’ll be investing in quality with Karcher. If you want a cleaner and quicker machine that can handle the typical tasks of a small business or home, you want to know more about the Karcher G 3000 OH. At 3100 PSI the MegaShot is the member of the Simpson family most suitable for your home and shop. Like its brothers, the MegaShot has a Honda engine at its heart. You’ll also choose between 0 degrees, 15 degrees, 25 degrees, 40 degrees and soap options for nozzles. It’s built to last too. This washer has heavy duty welded steel construction and a steel axle frame with 10-inch premium pneumatic tires. For cleaning decks, patios, house siding, outdoor furniture and prepping home exteriors for painting, the MegaShot gets around. It’s easy to transport too. Compact design and lightweight construction make the MegaShot small enough to be transported easily by one person. If you want the perfect machine for your home and shop you want the MegaShot. But you’ll need to work safe, no matter which pressure washer you choose. Remember, for high-pressure commercial washers, OSHA suggests that operators use Personal Protective Equipment (PPE). There can be hazards from turning the stream off and on. And the hazards aren’t limited to maritime use or industrial applications. Commercial pressure washers are powerful equipment to be used safely. Hearing protection may be required due to high noise. Depending on the toxic levels of the material being removed, PPE will also protect against skin contact. Eye protection is often encouraged when using high-pressure commercial washers. 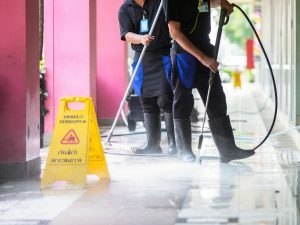 Make sure to take these precautions, and cleaning your home and business will be easy and safe. Any of these commercial pressure washers should be able to clean 40 to 190 square feet in 10 minutes. You’ll be cleaning effectively and fast with all of these pressure washer options. Still unsure which option is right for you? We can help. We don’t just help you shop at Pressure Wash Zone. We help you shop smarter. Don’t just take our word for it. Deciding which of the many commercial pressure washers is right for you should include reading trusted user reviews. Don’t wait to find the perfect pressure washer for you and your home and business needs. Visit our review section now and get valuable insight into the best commercial pressure washers for you.